The trip was a business trip to Las Vegas, NV from February 17-21, 2008 to attend Pink Elephant's ITSM conference at the Bellagio. flew from Houston, TX to Las Vegas, FL on Southwest Airlines Flight 1126, which was scheduled to leave Houston at 3:30 PM CST and scheduled to arrive in Las Vegas at 4:50 PM MST. Due to mechanical problems with the plane, the flight didn't take off until about 4:30 PM CST and ended up arriving in Las Vegas until about 5:50 PM MST, but had to wait for a gate to clear. used the Ritz Transportation hotel shuttle (cost $6 each way) and got to Bally's Casino and Hotel at around 6:50 PM. The hotel room was room 861A, which was part of a suite arrangement on the 8th floor in the north tower (called the renovated tower by the clerk who checked me in). Since it is used for meetings, there was only one queen bed (wall bed) and plenty of seating. The room did not have a good view even though it faces the strip. It is low enough that the roof structure of the casino area blocks most of the view. since registration for the conference ended at 7 PM, it was too late to do so after arriving, so I had to wait until the next morning. ate at Bally's Big Kitchen Buffet at a cost of $19.95 plus $1.55 tax for a total of $21.54 plus tip. Not sure it was worth the value. 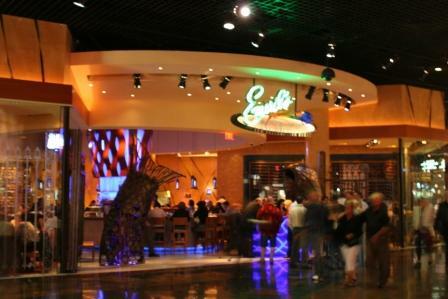 Note: the Big Kitchen Buffet was no longer open on 4/30/08 when checking the Bally's link. was in line for registration at 10 AM for Pink Elephant's ITSM conference at the Bellagio Las Vegas (as was several hundred other people). It took over an hour to go through the line and get the conference material. ate lunch at Todd English's Olives restaurant at the Bellagio. The salad was enormous and the chicken breast was excellent. The presentation of the chicken on a plank was distracting since I was concerned that the juices, when cutting the chicken, would run off of the plank. Really enjoyed the food and the cobbler was gigantic. The service was continuous checking by my primary waiter and several other people to ensure that I had plenty of iced tea and didn't need anything. Even the manager stopped by to check. I sat at the bar to eat since I was by myself and there was no waiting for the bar area. The bartenders, Isaac and Alex (along with a young lady whose name I never got), were excellent in serving the food, though Alex had to refer to the menu for descriptions at times. This meal was well worth it, but ended up being too much for me that night. I could not finish the desert and ended up only taking sips from the last two glasses of wine. It was a good thing I was taking the monorail back to Bally's and didn't have a car. We both had the same food and there was a lot of it. The ribs were very good and worth the cost. Ritz Transportation was right on time at 3 PM to pick up for the trip to the airport. I was the only passenger. I had to call the previous day to schedule the pickup, after having originally paid for the trip on Sunday. This was easy to arrange in just a couple of minutes. flied from Las Vegas, NV to Houston, TX on Southwest Airlines flight 3751, which was scheduled to leave Las Vegas at 5:40 PM MST and scheduled to arrive in Houston at 10:35 PM CST. Copyright notice: Information contain on this site is the property of the owner and must not be used without written permission. Please utilize the above contact information for information.